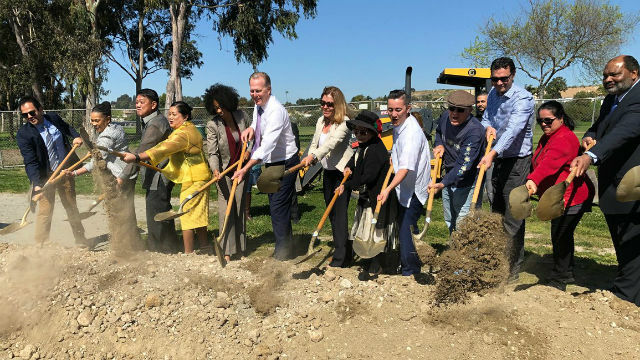 City officials broke ground Monday on the Bay Terraces Senior Center, a project that local residents have advocated for since the 1990s. Mayor Kevin Faulconer and Councilmembers Monica Montgomery and Chris Cate were on hand to mark the beginning of construction on the 3,400-square- foot facility. Once completed, the $6 million senior center is set to include amenities such as a multipurpose room and a commercial kitchen. The facility will serve seniors in Paradise Hills, Bay Terraces and Skyline, according to the city. Faulconer revived the project in 2016 and city officials expect it to be the city’s first building to produce as much energy as it uses by leveraging solar panels on the facility’s roof. According to the city, the project is partially funded by the U.S. Department of Housing and Urban Development’s Community Development Block Grant program. City officials expect the facility to be completed in October 2020.